Many things are changing fast today and credit go to digitisation. Someone has rightly quoted, “Digital moves fast.” With everything going digital, the style in which the traditional rummy was played has also changed. If you have been playing rummy on online websites five years ago, then it is considered out-dated now because now it’s available to play on your mobiles and tablets. Now the game is not only available to play online but also on smartphones and tablets. Online rummy games are an excellent platform to develop your mental capacity and decision-making skills. It even provides you that much-needed break from the routine life thereby offering you an opportunity for social interaction. Further, online rummy does have a positive effect economically in terms of the money and rewards you win while playing the game. Let’s see how this shift of traditional rummy to online rummy has impacted the social and economic life of the players. Now-a-days, Boredom is one of the key things plague people. They are always looking out for getting involved in a leisure activity that relieves their boredom, keeping aside the time constraints. With busy schedules, they prefer staying at home to relax and hardly socialise. Online rummy has proved itself in people from their boredom as its available to play on web and mobile both. Moreover, they get to socialise from the proximity and comfort of their home. Online Rummy do have a social impact in the lives of human beings. Thanks to its availability 24*7 that the people get to connect to their peer players at anytime anywhere. Moreover, players can see when their favourite players or opponents are available on their PCs and mobiles so that they connect with them. Basically, players get to socialise and create bonds with people of similar interests. In present day life, people have to move away from their home towns to big cities either for studying professional courses or for getting employment. This creates loneliness in their life as they have stayed away from their family and close friends. Online and mobile rummy games have come as a saviour to rescue them from loneliness. It has been like an online social outlet for such people giving them a sense of belonging to a community with similar interests. If we consider from the economic perspective, online rummy games like 13-card rummy, 21-card rummy, etc. have provided players with a means of making an income. People can earn part-time income by playing rummy games. Moreover, these games also offer other rewards like gold/silver coins, movie tickets, lifestyle vouchers, etc. to the players. Thus, rummy acts as a supplement income source for the players. Changing the outlook of the society is another economic aspect that online rummy has fulfilled. The game that was earlier considered a pure card game has now been declared as a skill game by the Supreme Court of India. 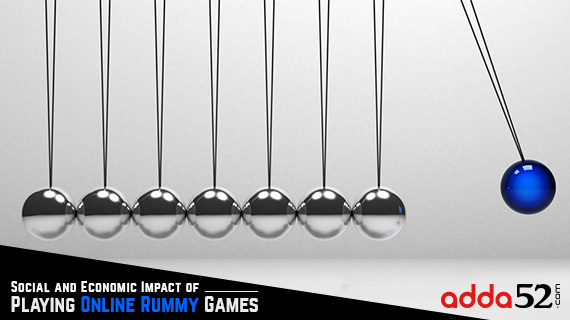 This has changed the outlook of people towards the game, and encouraged them to pursue rummy as a professional sport. Here, a small credit also goes to the free rummy games available to play online which help amateur players to develop necessary game-play skills. Therefore, traditional rummy has cleared all the assessments in relation to its development as online rummy games and then getting transformed into a mobile app game.